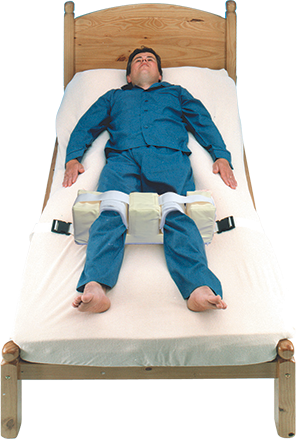 Sleep positioning systems provide support to keep the user’s body aligned throughout the night. 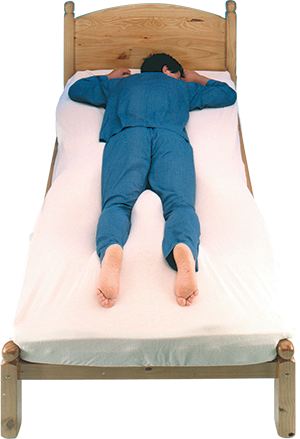 For individuals who may be unable to position themselves, it is important to keep the body aligned in order to prevent physical deformities caused by poor posture in bed. Most sleep positioning systems are placed on top of an existing mattress and use specialized pillows, cushioned brackets and other forms of contouring the body to maintain proper alignment throughout the night and/or day. It is important that individuals who use customized seating throughout the day remain supported while sleeping to prevent any regression of improvements made from their postural seating systems. Night time positioning is an essential part of a 24 hour posture plan since individuals will spend large periods of time in bed. Using a positioning system at night will help improve sleep quality and keep the user comfortable throughout the night. Cool-over mattress which provides a temperature moderating material to maintain comfortable positioning and support. This system, though new to the United States, has been developed and used with great success in Europe to address the above needs for individuals with postural asymmetry (conditions as noted above). We are excited to bring this incredible system to the Wisconsin, Illinois and Minnesota regions to improve the lives of individuals with diagnoses such as: Cerebral Palsey, Spinal Cord Injury, Parkinsons Disease, Traumatic Brain injury, Multiple Sclerosis, ALS, and other diagnoses who are living with the above listed issues. Some of these issues can be addressed or even improved with the strategies implemented through 24 hour postural support. BILD’s team of physical and occupational therapists will help you evaluate if this system can assist you in achieving postural correction.